Make these cheerful bunnies from craft foam, cardboard or card stock. Print out the full-size bunny pattern and trace it onto a sheet of white craft foam (or cardboard) and cut around outside lines. Using a coloured pencil, tilted to the side slightly with the point of the pencil facing away from the foam piece, colour the perimeter of the pattern pieces. Refer to photo. The pencils create a nice shading effect, where as markers will be a little more defined. Following the lines on the pattern, shade the circles around the bunny’s feet, tummy and ears with the same colour as used on the perimeter of the bunny. To paint the bunny’s face, use a black permanent marker and a red pencil to shade the rosy cheeks. Using a green pencil draw little lines at the bottom of the bunny for a little grass. Tie a bow with a scrap ribbon piece and glue in place at the bunny’s neck. Refer to the photo often for colouring and details. 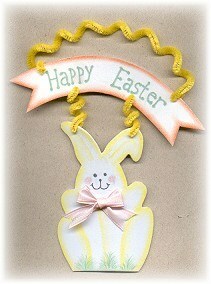 Using a permanent marker write “Happy Easter” across the ribbon banner. Poke holes where indicated on the banner and on the bunny. I used a sharp toothpick for this. Chenille stems can poke the holes, but it is a little more difficult. You don’t need a large hole, just toothpick size. Twist one chenille stem around a pencil to create a swirl and insert the ends into the top of the ribbon banner. Insert just enough to be able to twist the chenille stem up to secure in place (about 1/2 inch). Cut a second chenille stem in thirds and wrap two pieces around a pencil to create a swirl. Insert one end of one piece of the twisted chenille stem, into the ribbon banner and the other end into the bunny ear hole. Fold the stem up to secure. Repeat for second hanger on bunny ear. Sign your name on the back with a pen or marker and Happy Easter!